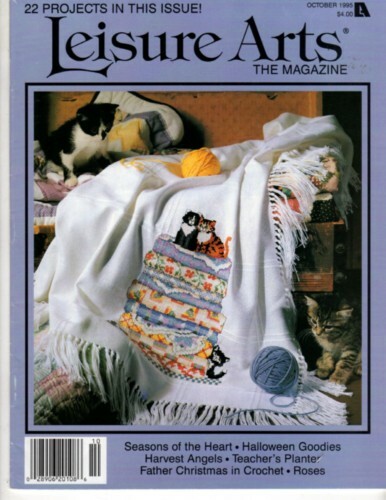 Leisure Arts The Magazine October 1990 cross stitch magazine. 22 porjects. Cat's Meow Quilts, Seasonal Angels, Seasons of the Heart, Roses, Halloween Goodies, Father Christmas (crochet), Floral Quilt Afghan (crochet), HOt Pad Pizzaz, Crafty Crows, Paper Sack Pumpkin, Teacher's Planter. In like-new condition.